The Little Rock Rosebuds were a professional baseball club in the 1895 Southern Association. It's not clear whether Little Rock had an official nickname in 1895, but if so, it was likely the "Rosebuds". 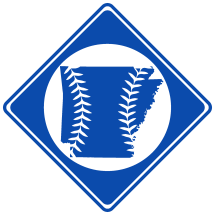 Traditionally, the team's nickname has been recorded as the Little Rock "Travelers", a nickname of a future Little Rock baseball franchise. However, the Arkansas Gazette, a newspaper that reported on the club routinely in 1895, never referred to Little Rock in 1895 as the Travelers, instead calling the team the "Rosebuds". The nickname likely originated from the city of Little Rock's motto, "The City of Roses." The team played at West End Park. Little Rock dropped out of the league in midseason with a losing record. Gates Appears he filled in for Little Rock at 1st after Wiley was injured and before Knoll was signed. Maybe from Evansville. Michael Hobright From the Steubenville, OH / Wheeling, WV area. 8. "Foxboro’s 19th Century Professional Baseball Players: Gorman & Sumner"